A 54 year old woman presents with severe asthma. Chest X-Ray reveals an anterior mediastinal mass. Upon resection, the mass is well circumscribed, encapsulated, 7.9 cm maximally. Grossly the mass consists of back-to-back cysts ranging from 0.2 to 1.8 cm. The intervening tissue varies from soft to fibrotic. 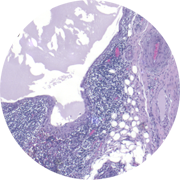 The main histologic features include multiple cystic cavities lined by squamous or cuboidal epithelium. A few scattered islands of non-neoplastic thymic tissue are present within the cyst walls. There is patchy acute inflammation, fibrovascular proliferation, and cholesterol granuloma formation. Hassall’s corpuscles are not present. A diagnosis of acquired multilocular thymic cyst was rendered.